It was a lifelong passion for yachting that led the Scaburri brothers, who had no experience as boatbuilders, to start a boatbuilding company in Bergamo, Italy, in 1987. It was also the family&apos;s success as industrialists in a field that couldn&apos;t be further from the sea that has helped ensure its success. The four brothers that founded Uniesse Marine are fourth-generation owners of the largest button-manufacturing business in the world. How the production of buttons has given Uniesse Marine an advantage in boatbuilding, where so many others have failed, is a remarkable story. Like boats, buttons were once made exclusively of wood, and the Scaburri family was expert in selecting the finest hardwoods for its buttons. In the 1960&apos;s, when plastics came in, the brothers became masters in the field of resins. Today Uniesse purportedly uses a polymer originally developed to keep buttons white to maintain the finish of the yachts&apos; gelcoat. But while the Scaburris&apos; knowledge of boatbuilding materials was impressive, they needed to find someone who could translate this knowledge into a good design. 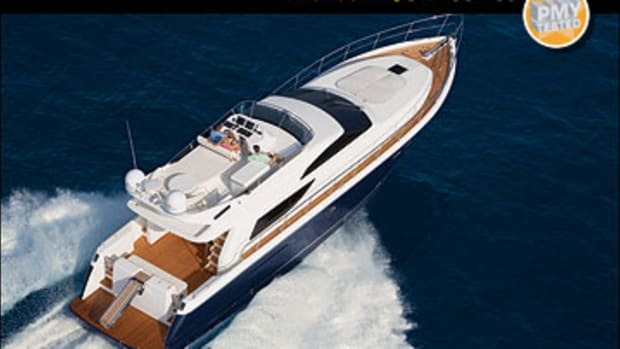 Miami-based industrial designer Fred Hudson had the pedigree to meet their vision of merging an aesthetically pleasing boat with a hull design that was tough enough to handle rough water. Hudson began his career with Chrysler, where he was part of the team that created the blazingly fast 300 series. After moving to AMC, his successful collaboration with Italian coachbuilders in refining the late 1960&apos;s AMC AMX speedster was perhaps a sign of things to come. He also had experience in boatbuilding: As chief exterior stylist for Chris-Craft from 1960 to 1964, he was responsible for the classic Constellation line. Today Hudson has designed every Uniesse since the company&apos;s inception in 1987. Along with style, the brothers demanded substance, so Hudson&apos;s hulls are built to deliver. 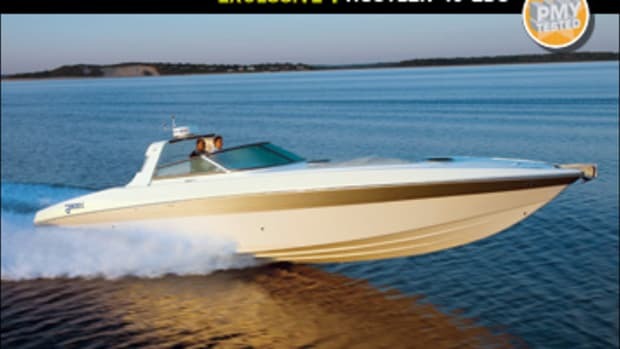 The 53 MY, like all Uniesses, features a solid-fiberglass bottom—the 53&apos;s is purportedly three inches thick—with sides and deck sandwiched with Airex core, and every 18 inches the hull is reinforced with a solid-box grid system. According to Uniesse, the combination creates an unusually stiff hull that is designed to withstand extreme conditions. 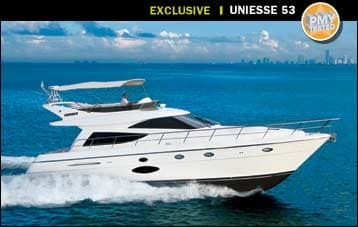 I was made aware of all this before I arrived in Miami, for a sea trial on the 53 MY. So once I found her, I quickly boarded and went directly into her engine room, accessed through a hatch in the cockpit sole and down a stainless steel ladder. The grid was indeed beefy, as were the fiberglass-encapsulated mahogany engine bearers (which reached above my shin) and the through-bolted engine mounts that secured the twin 710-hp Cat C12 diesels. Space, however, was limited: I measured 5&apos;0" of headroom, forcing me (5&apos;11") to crouch, and less than two feet between engine bearers, tight for a mechanic and his tools. However, the banks of AGM batteries outboard of each powerplant were easily accessible, as were the 13.5-kW Onan genset and Racors. The engines were also serviceable on all sides. 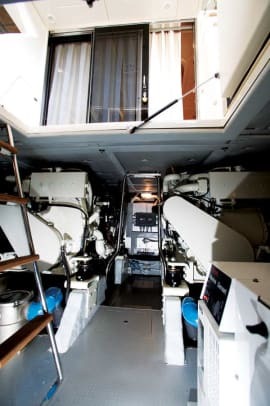 While the engine room revealed the 53&apos;s solid construction, I was eager to see how Uniesse&apos;s background in fine hardwoods would translate into the 53&apos;s interior. From the Burmese teak cockpit, I entered the saloon through a three-panel stainless steel sliding door. Although the morning was rainy and gray, the light coming through the door and the forward and side windows was enough to show off the 53&apos;s interior, and the woodwork was stunning. Tanganyika, a rare African hardwood with a reddish-brown hue, is Uniesse&apos;s wood of choice throughout. The spot-on grain match, superlative joinery, and nine-coat, high-gloss finish exemplified the skilled artisans who performed the job. With all that gleaming wood, I failed to spot the galley and at first assumed it was down the centerline stairs. 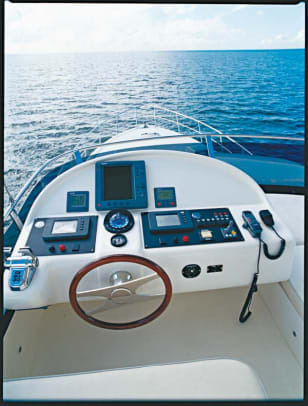 But my test boat had the optional galley-up aft and to starboard (the standard layout is three steps down and to port, just aft of the lower helm), tucked under a Tanganyika counter that rises on gas struts to reveal the standard three-burner Kenyon cooktop and stainless steel sink. Countertops were Botticino marble, below which were two Sub-Zero drawer-style refriegerator/freezer drawers as well as five cutlery and cookware drawers. Above, the cupboards are shallow; they&apos;re fitted with stemware and plate holders and are also crafted from Tanganyika. Buyers who wish to cruise for longer than just three-day weekends may opt for the standard galley-down version, which offers more total countertop space and room for an optional dishwasher. 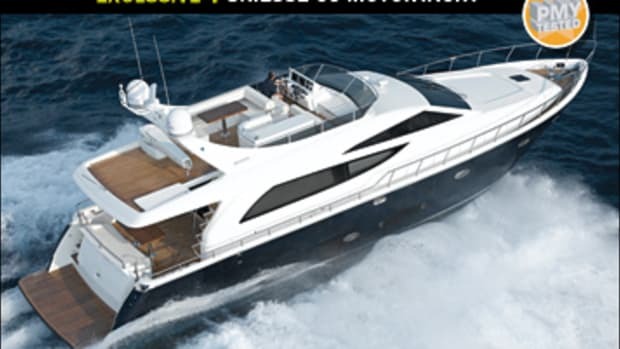 However, it isolates the chef from the rest of the saloon and cuts into the 53&apos;s full-beam amidships master, which features a dressing area that&apos;s more like a walk-in closet, complete with a 38"x28"x53" hanging locker and full-length mirror. The en suite head, on the same level, is a real beauty, with Botticino marble and inlaid onyx countertops and floors, a Techma MSD, a bidet, and a split-door shower that has 6&apos;5" headroom and room for two. Two steps up from here is the master itself, with a six-drawer dresser to port, a vanity /desk to starboard, and a queen berth. 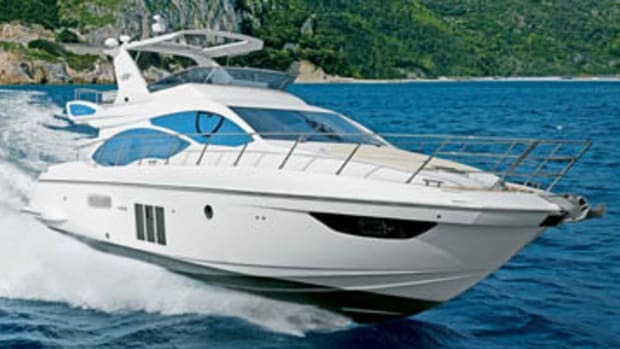 Our test boat had the optional layout with VIP forward and two single berths to starboard, with the VIP and guest staterooms sharing the forward head, which also has a separate shower. 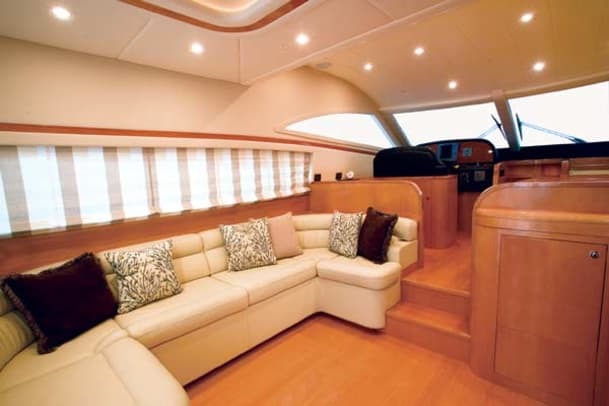 All staterooms are accessed from the saloon&apos;s centerline stairs. 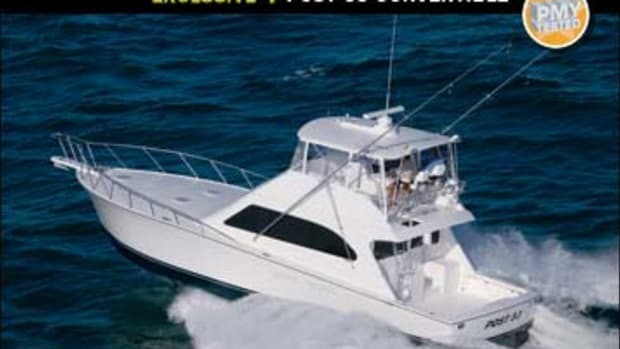 When it came time for the sea trial, I opted to run from the flying bridge, accessible from the cockpit via molded fiberglass steps. Given the rainy conditions, the lower helm might&apos;ve been a drier choice, but sightlines are not as good from there as they are from up top, where they are excellent in all directions. I measured an average speed of just over 40 mph in a steady two- to three- foot chop. 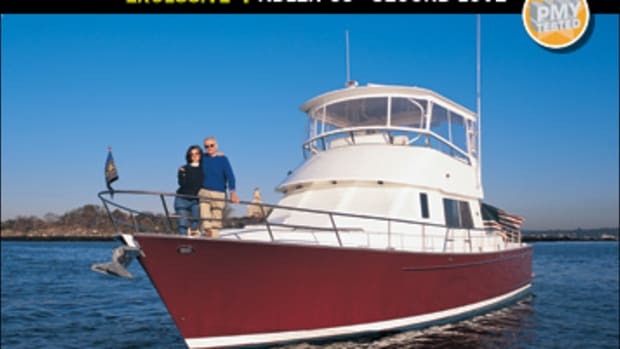 The occasional four-footer and large wakes from other vessels didn&apos;t trouble the 53, and with her standard BCS hydraulic steering, she banked sharply, with hardly a loss in rpm, something that likely can be attributed to Hudson&apos;s modified-V running surface. 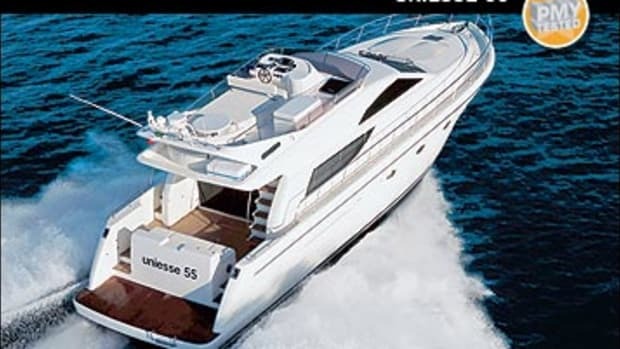 Performance like that explains Uniesse&apos;s success in the States, noteworthy considering the competition it faces from other Italian boatbuilders, with Azimut, Aicon, and Ferretti offering similar-size flying-bridge models. 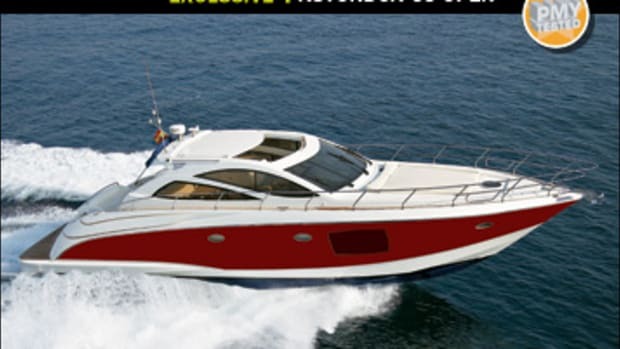 And while each of those builders has a revered lineage of its own, Uniesse&apos;s one-two punch of Italian style and Yankee hull design may just button up the market. 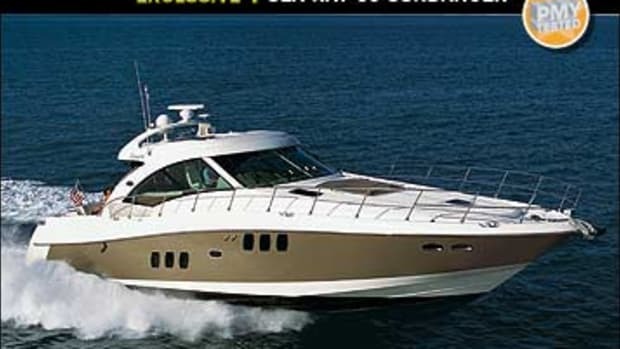 This article originally appeared in the December 2005 issue of Power & Motoryacht magazine.